Yes, You Should Give Google Your Mobile Number - Ask Leo! Google will use your mobile phone number for verification if you lose access to your account. Some people don't want to provide that information to Google. In one of my more important articles — A One Step Way to Lose Your Account … Forever — I discuss the sad reality that accounts are frequently lost because people fail to set up recovery information (or keep that recovery information current). In most cases, it’s a simple oversight with disastrous results. One day, your account gets compromised somehow, and you have no way to prove you are the legitimate owner. Without that proof (in the form of recovery information used to verify your identity), your account is no longer your account. Period. Forever. Sometimes, however, there’s a much more frustrating reason people fail to provide recovery information — in particular, their phone number. Your phone number is one small part of your identity. As long as you maintain that number in working order, it’s how the people you share it with reach you. Even if you lose your phone, that number can be quickly reassigned to its replacement by your carrier. If an online service needs you to prove that you’re the account owner and you have the right to log in to that account, even if the password doesn’t seem to be working, that phone number you gave them is the proof they use.1 They text you a code. Your ability to provide that code when asked proves you have the phone at that number. Yet, some people are absolutely convinced that if they hand over their phone number, all of a sudden Google is going to do exactly that, and probably more evil things they can’t even think of. It’s frustrating, because many systems, such as Google’s own two-factor authentication, can use non-SMS-capable phone lines to provide a code at recovery time via automated voice. Why this is not currently available for alternate account verification, I have no idea. I keep saying “when, not if” you run into account access problems, because it happens to all of us, for a variety of reasons. It’s just a matter of time. Without alternate access information, you stand a real chance of losing your account forever. Some day, you’ll be very, very glad you did. How Do I Change the Mobile Number Associated with My Hotmail Account? - Mobile numbers are an important component of Hotmail and Outlook.com security. I'll review how to change the mobile number and keep it up to date. 1: I use the term “prove” a lot, and in an absolute sense, I’m wrong. The goal here isn’t to prove beyond any shadow of a doubt that you’re the account holder; the goal is to use reasonable means to provide a reasonable level of proof and a reasonable level of added security. 2: You’re just not that interesting. I always give my mobile number when signing up for accounts I deem important enough not to want to lose. I don’t rely only on that, as there’s always a chance that might not work, for example, when traveling or my phone gets lost. In addition I have 3 or 4 alternative recovery email addresses. It’s important that at least one of those recovery addresses doesn’t require a second factor of verification when traveling out of the country. For that, I use gmx.com as one of my recovery addresses. It’s a reliable company, coincidentally owned by my ISP, so I don’t expect them to disappear. I have received many annoying sales phone calls from Google advertisers. How did they get my phone number? I am reluctant to give my phone number to businesses. I never know who it’s going to be given to, despite assurances that it won’t be given to anyone. At one time I had an alternate number that I never answered except for account verification. But maintaining that number cost me money. Why should I have to pay to not be disturbed? Leo, do you know any way around this problem? Why can’t an email address be used for verification? That is not Google calling you. Scammers often lie to you and tell you they are from a reputable company. Google says they won’t use your number for anything but account verification. If it turned out not to be true, they would be open for civil an possibly criminal charges. You can give them an email address – look at “Your current email address” in the image above. I believe strongly that Google does not share the phone number you specify as a recover number for your Google account. Advertisers and spammers have many other ways to get phone numbers. To further state they would leave themselves open to a lawsuit if they did so is even more laughable. As I mentioned they would simply change the policy and state your mobile phone number will be used for whatever new thing they may deem advantageous to Google as Google sure as hell does not have it’s Customers best interest in mind when they do anything. Google among other massive Corporations has been allowed to become a massive monopoly gobbling up more companies in a given year than one company should be allowed to in a lifetime. The next policy change would explain they are now going to share your mobile phone number with other companies that Google deems you might be interested in due to your shopping habits (or an email that was scanned for key words) or whatever other reason they might give. If you feel that way, just set up an couple of recovery email addresses and your account should be just as safe. I have already done so.. This is why I am questioning the request for mobile phone numbers in the first place, I’ve had the recovery email address set up for years and years, as has everyone I know, and not because I suggested it but because Gmail/Google requested it when they set up their accounts. As a matter of fact on my “second” Gmail account when I failed to provide a recovery email address for months on end instead of allowing me to just log in I was reminded I did not provide Gmail with a recovery email address. So either Gmail/Google stopped requesting recovery email addresses after I set-up my last account or they already have a recovery system in place and under the guise of convenience, because apparently everyone but me and 9 other people in this country text, Gmail now wants one more piece of personal information from us. I understand Leo’s point of view as well as yours comes from a different place than mine, but I fail to see the need for a mobile phone number as proof of identity at all, except for an agenda not yet revealed. And when Google gets hacked, in addition to email passwords and accounts the hackers will have phone numbers of mobile phones as well. To what end? I am certain I have no idea..
You also have the option of getting ten (?) single-use backup codes. I think these can be used if you don’t have access to yr phone for whatever reason. In my case, I work in a correctional centre, and can’t take my phone in. Hey, when you lose your mobile phone, how does the cellphone carrier identify you as the rightful owner?, with your Google account? Why are websites always asking for security questions, if they can’t be used to re-establish your account? So sorry, I don’t agree with you. Google doesn’t NEED my mobile phone number, anymore than the cellphone carrier NEEDS my social security number. It’s a flat out intrusion into our privacy. And I’m not buying into the claim that Google will not sell the mobile phone number. Maybe not in this current environment, but what happens when someone buys Google? Will the new owner hold to the old policy? So if Google is not willing to give me another way to prove ownership of the account, I will have to live with the possibility of the account being compromised, and lost. Who will buy Google, GOD? They are the ultimate ACME. In case you haven’t noticed, every company has a limited life. Eventually, their value falls, and someone buys it. You’re right. Google doesn’t need your phone number. They’re simply asking for it to make things easier for you. If you don’t feel comfortable with that, than don’t. Just set up a couple of alternate email accounts and it’s just as recoverable. I personally think giving my cell # is fine. One more safety net. Coincidentally I was just reading past comments at yahoo due to an objection about their new, and stupid, page design. identity. It gives the option to do it “Later” but no “Never” is offered. Some of us, believe it or not, never have had mobiles and never will. Oh and of course a land-line is outta the question. As I said in the article, they could support using a land line, as they do for two-factor authentication. I just don’t know why they don’t. The later option is tantamount to never in that case because they probably will never offer it to you again. You’d have to go into Options to add a cell number. No need to block that option so that if in the future you do get a cell phone you can still do it. As for the land line option, as I said in a previous comment, some VoIP services like Magic Jack, Skype etc. can receive texts. First of all, I’ve never had, nor will I ever have a mobile phone. I’ve put my cordless handset in my coat pocket and found it there 40 miles later at my mom’s, but no dice. Secondly, I just don’t think my You Tube account is all that earthshattering to lose, even if I do have some of my own content. I don’t use Gmail and I killed off my Plus page because it was being used by outside parties as a discussion group in an Arabic language anyway. That was over two years ago. Some yayhoos can always deface my insignificant websites I’ve joined, and they do for giggles. I’ve been an 8 year old for 43 years, been online for twenty years, I’m not going to die from it. I don’t face or twit. For several years I have used a Google Voice number as my primary. I suddenly realized that I also unthinkingly listed it with Google as my recovery phone, and how foolish that is — if someone took control of my account, they’d have that number in their control too! Good post! If you are worried or have problems with calls you don’t want sign up on the national do-not-call registry. It has worked for me, and I rarely get spam calls. Plus, with a smartphone it is very easy to monitor incoming calls and just ignore the ones that come from unknown sources, then block those numbers. Works like a charm. The big issue I have encountered is that when traveling out of the country where your mobile phone is registered many of us have no service and no way of receiving texts or calls on that number, meaning you can be locked out when Google decides that you are logging in from a suspicious IP address. This is a common occurrence experienced by travelers. If you are on the move you might get locked out every day, or even more often, requiring time-consuming account recovery, especially if you don’t have alternate email addresses on another provider that don’t require elaborate authentication to access. Those are situations where having a couple of alternate email accounts for recovery and authentication are so important. I live in Germany, and when I travel to the US, I can receive text on my German phone in the US, and it’s free. Before traveling, you’d need to check with your provider about receiving texts out of the country. Zepher, I have both a land line and cell. I signed up for the federal do not call list and it worked for a few years but now I get 3 or 4 calls a week on the land line. I’ve reported the numbers but it doesn’t work. Signing up with the do not call list a second time hasn’t helped. According to the news most of the calls are originating over seas and they are somehow making it look like the call is coming from a US area code. There is no way to stop them. I just don’t answer the phone and reverse lookup the number. If the call is legit I call them back. My doctor, Vet, family and friends are the only people I give my cell number to. My wife and I don’t have cell phones. Why can’t my landline phone number be used as a secondary verification. Of course Google could not text my landline but they could call and leave a 10 digit code number on my answering machine that I could then use to access my gmail account. Why is the above scenario not a possibility? As I said in the article, I don’t understand this either. They do support voice-only land lines for two-factor authentication. Why they don’t support it for account recovery is beyond me. But as I’ve discovered looking for a solution to this. VoIP services like Magic Jack, Skype-in and others allow you to receive texts. They’re not free but they are relatively inexpensive. I have to agree with the sentiment that this step is not acceptable in an account set-up. There is the option to supply a different e-mail address, and this can be done easily enough. Furthermore, the blatant assumption that everyone has a cellular telephone, and even more so that those who do have cellular units automatically have smartphones or texting capacity, is ignorant on the part of Google (or any other supplier). I not only do not have one, I have many friends who do not have a cellular telephone. It is not as rare as you might think. Properly set up security questions, as well as a back-up e-mail address should be all that is required. I think supporting a land-line would address the first part of your comment, and I wish they would do so. The problem with security questions is that experience shows people don’t “properly” set them up. Either they don’t remember the answers (amazingly common), or they answers are easy to discover publicly. This is why most providers are moving away from using them at all, in favor of alternate email addresses and phone numbers. I’ll agree that verification by alternate email is probably just as effective as using a cellphone. I would guess that the average user doesn’t have a second or more email address and many wouldn’t be able to set one up. For them, the phone verification is much easier, and it’s absolutely safe! If you don’t trust them, then I’d say you’re just as protected with a couple of alternate email addresses. If you have a Google account, a real good way to not loose your account info is to simply type it in as a note to your cell phone (i.e Samsung’s Memo). This way you don’t have to worry about giving out your cell number & as long as your phone remains secure, you will always have your account info handy. For those without a cell, write it down on paper, then put that paper in your wallet/purse. Problem Solved. If you mean write down your password, that is not a good idea for a couple of reasons. 1. That won’t help if Google wants to verify your account when you’re using a different computer or device. 2. Writing your password down opens you up to someone finding that piece of paper and getting into your account. Hi I tried to get a new Google account, but I have no mobile phone # or phone! so that was it . I only have a Land line, no new Google new account for me I guess. Of course Google can give your phone number to someone else. It can give it to the police, if presented with a legal document. You don’t want that. In some parts of the world, no phone number can be anonymous. You can’t have one unless it’s tied to some official ID. It’s funny how few people take that possibility into account, as if it could not hit them personally. The police only come after bad guys, and I’m a good guy. Think again. If you’re that concerned I don’t understand how you can have a Google account at all. The police can just as easily use that to trace you as a phone number, if they have the appropriate legal standing in your country. We continue to use gmail because we have established addresses, created “anonymously” in the past. What’s mystifying is the causal indifference in your defense of sharing personal identity with google. Mobile phones are registered with complete identity information that makes every email, text or search in your google account family exposed to information correlation, retention and sharing with other businesses and authorities (warrantless, to boot). The reason to give your phone number is to be able to secure your account. There is nothing disingenuous about that. If a person is going to use any technical services at all they will not be 100% anonymous. It’s a fact of modern life. In other words, if you have a Gmail account at all then you are trusting Google with sensitive information. So why suddenly become paranoid about your phone number? Your assuming that those relationships don’t exist even before the phone number is handed over. I stand by my position: I don’t believe Google has the agenda you fear, and the number is, truly, about getting your account back in the case of eventual compromise. Paranoia that is really so far out there, its crazy. My bank account was recently hacked and the theives started out with small amounts, all to my good luck. I have a national brand email account other than Google but I do have gmail as well. Naturally, the hack occurred on a Friday night, when real people aren’t available to help with questions that go beyond the normal “FAQs”. What started out being a text alert from my bank stating that my recent password change was successful, I decided to check my account. Obviously I couldn’t get into my account because someone other than myself had changed the password. Now in panic mode, I decide to check my email for any messages from my bank. Well, as luck may have it, I couldn’t get into my email account either. Fortunately, I do have several email accounts which I use for recovery issues such as this. Having dealt with getting my email access back because of having alternative email for recovery, I checked for any messages from my bank which there were none in my inbox. For some unknown reason, I decided to check my trash folder and I discovered one email from my bank saying if I was not responsible for updating my password that I should immediately contact my bank. With it being late Friday night, I was not going to speak to a real person, therefore I would have to wait until Monday morning before I could get anything accomplished. Also, as a side note, my investment account can be easily accessed thru my bank account once you are inside of the account. My investment account had a seven figure cash balance, just to give this some perspective as to the serious nature of what happened. Once I had gotten back control of my email and my bank account, I was amazed at the damage that was done and at what could have been done. With control of my email account, the thieves were intercepting all emails coming from my bank. Apparently once my email was hacked, the culprits surely did a search for any emails from banks. In doing this, it would have been really easy to ascertain which banks I deal with. From that point, going to my banks login site and stating forgot username, the bank would email a link to correct this. Then the same with my password, all of this going to an email account they now controlled(the thieves). Now they are in my bank account that easily, along with access to my investment account by clicking a link on my accounts page. In my account I found three payments totaling $1200.00 that were to people I didn’t know and these payments were set up to pay them using various email addresses. The thieves also transferred $10k out of my investment account into one of my three different bank accounts, my assumption is they were testing what could be done within the website and quite possibly what limitations in amounts might exist. Fortunately the $10k didn’t leave my accounts, basically just moved around. After finally being able to notify my bank about the fraudulent transactions, the bank required that I open a new account, which also meant that I had to go to a bank branch to show I.D. along with new signatures, etc. etc. So that I would have time to download all statements and other things, the original person that I spoke to earlier that morning placed a freeze on my money in all accounts as well as placing a negative balance of $700k on my hacked account. So after going to get things done at the local branch, I thought all was good. Unfortunately the person who helped at the branch removed the negative balance in my original hacked account which allowed for three ACH withdrawals totaling another $6k. The bank assured me that I was not responsible for any financial losses, but the time and aggravation of dealing with all of this seemed to be never ending. Thinking this was all behind me, I received a letter about two months after this incident from the IRS stating that my tax payment of over $100k bounced because my bank information was incorrect. I neglected to check and correct my banking info for the IRS to automatically withdraw the payment from my bank. This has been quite long, I understand that, but I just wish to emphasize how important it is to have a two step authentication process, which was suggested to me by the fraud department at my bank. I now use the two step thru text messaging on my phone for every email address, bank or whatever. Just to note, although I lost no money thru the fraudulent bank transactions other than my time, it did cost me around $1,000.00 to the IRS due to late fees, penalties and interest. Now a thief will have to have my cell phone before he/she can hack my email accounts. I hope this helps people understand some of the never thought of consequences of not using the two step process! In Europe, all bank transactions must be verified by a TAN (transaction account number) before any money can be moved. Most now allow the use of mobile TANS via SMS text. Many still use a printed list of one time TANs which is also safe, as long as you keep the list protected. I scan mine and encrypt the file. Then I shred and flush the original list. Be careful when flushing that you don’t cause a data overflow in your toilet :-). I seriously don’t understand why the US is so backwards in their banking. Just my two cents. I don’t have any problem giving my cell phone number to Google. As of this writing, I am on Google where I had to log in and received a code in order to access my account. My question though is: Why on earth, Google doesn’t acquiesce my request “Not to ask for a verification code on this computer”?. There’s a check box with that phrase right below the field where one has to enter the code. I always put a check mark in that box, but whenever I try to sign in to my Google’s account, they keep on sending me a code. My point is if you say something, you have to abide by what you say. BTW, I am the only one who have access to my computer. And I also have two Google accounts, which means every time I am subject to receiving two codes since I always login to both accounts. To me, that’s very annoying and hyperbolic. Google’s setting to “Not to ask for a verification code on this computer” works on my computers. So you may want to look at your own personal settings of your browser to see if something there is causing your problem. For instance, if you have it set to delete cookies as you exit, then Google (or any website for that matter) will not be able to remember you. Thanks for the reply. I think that is probably why. My settings are to delete cookies on exit. I am going to change that and see what gives. Thanks again. I’ll post back. If you regularly clear cookies that’ll cause Google to “forget” your request. I have just checked my settings and the problem didn’t have anything to do with cookies being deleted on exit. My mistake!. I thought my settings were to delete cookies on exit, but that was not the case. I didn’t add any site to that regard. At any rate, I took the time to review my main settings in the Privacy section and in all likelihood the problem seemed to have been related to: “Automatically send usage statistics and crash reports to Google” whose radio button was at Off; and to: “Keep local data only until you quit your browser” whose radio button was at On. I switched them back to “On” and “Off” respectively and that seems to have resolved the issue; because after that, I logged out from my Google accounts (2) and logged back in again. This time around, I didn’t receive any code to enter. Google, whom I have renamed Ogle, is only as safe as their character. A couple of years ago I bought a Nexus 7 tablet from Verizon for the ridiculously low price of $49 and only $10 / Month. Steal right? One day I was perusing through the technical information and came across Google App Permissions. To my shock it granted itself full access to your cameras and microphone with the ability to record video, pictures and audio, WITHOUT YOUR PERMISSION OR KNOWLEDGE!!! This gifting occurred by the act of merely owning the device! I took the tablet back to Verizon. They informed me I had only 14 days to return it and I had already exceeded that time limit! Seems someone at Google realized that if anyone came across this outrageous and blatant usurpation of personal security and privacy they would immediately try to return the device so they made the refund period so low that only the most avid technophile was likely to discover the breech within 14 days! I kept the tablet in a tin Charles Chip can for the next 2 years until I could cancel service. I tried to interest a couple of TV news outlets, but shockingly they showed no interest. This is absolutely scandalous. It’s a government spy machine and I told Verizon’s employees they better tell the girls some pervert could be spying on them in their bedrooms and taking their pictures!!! Last I looked, they’ve reworded things slightly, but nothing has changed! Why doesn’t anyone sound the alarm over this? It’s Big Brother and we’re just acquiescing and letting it happen without a whimper!!! Some people still have no mobil phone, me being one of them, so whats the alternative? There are some online phone services which give you a number and allow texting. An easy one that comes to mind is MagicJack. The fact that using a cell number for authentication is on of the least logical and least secure methods, and yet Google, Yahoo! and everyone else is rying to pressure people into providing it, is what causes the suspicion. These companies all have a poor track record when it comes to honesty and protecting privacy, so when they take such an illogical approach and close all other doors, people rightfully suspect they have an anterior motive. Thanks Leo for the service you provide. Here is my current problem. I have a trusty HP desktop running XP with a number of old, mostly engineering programs, like PSPICE, that I hold dear and only use for non-commercial projects at home, perhaps once or twice a year. So I keep my old friend (and programs) in mothballs, disconnected from the internet to hopefully preserve its integrity and usefulness. That said, very recently I discovered that I couldn’t print “anything” from my XP machine. My HP LaserJet 6L (parallel, non-plug and play interface) works fine, but remains comatose as far as the two working together goes. I’m writing to you from my Windows 10 (W10) ASUS laptop on the internet. What I want to do is download new drivers from the net to a flash-drive on my W10 machine, that I can than use to transfer the new drivers to my XP machine, to hopefully restore my printing capability from same. Can you help, Everything I’ve found on the net seems to require an installation program that works (runs) only on the target download machine, my W10 machine in this case. Two solutions come to mind: getting drivers directly from HP for that printer. That’s an old enough printer that what they offer may only work on XP. If they offer anything at all, that is, which could be a bigger problem. Another solution is to try something like a print-to-pdf driver – like CutePDF – and install that in the XP machine. Print to PDF, then take the PDF to your Win 10 machine that can print normally. Big caveat here is to watch for PUPs when you install the print-to-pdf driver. Thank you for this article. I wanted to ask a question and this article came up on search of this site. “Brand” account. This is a helpful feature I use when posting on YouTube. I now need a second Brand account for another Google-owned forum. A website I formerly belonged to has closed down and some of the friends I had are posting on G+ … I want to be able to use the name I used on the prior forum for this purpose. Keep in mind again that a Brand account is merely a subset of a Google account. 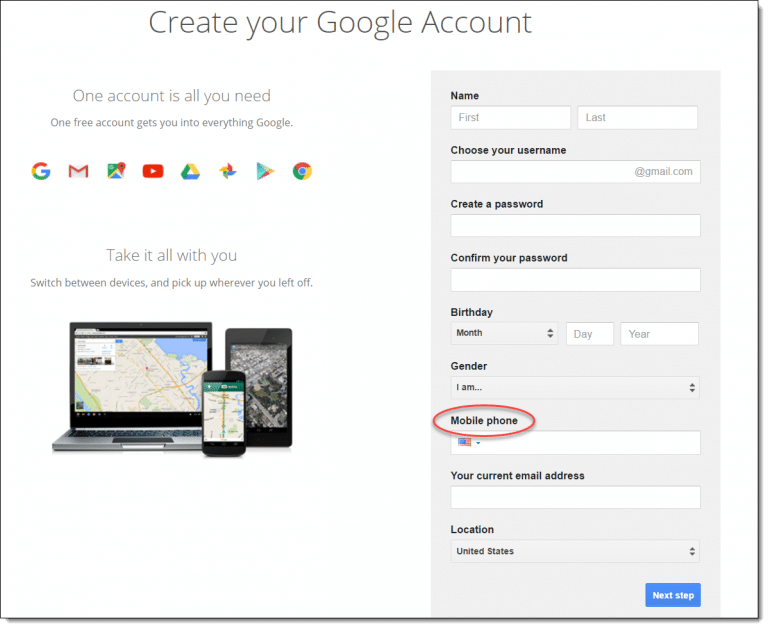 The problem is that when I try to set up my second Brand account it is essentially like creating a new Google account in that they are now REQUIRING a mobile phone number. I do not have a mobile phone. There are numerous services online that offer temporary mobile phone numbers for this purpose but none work, either the message is “number has already been used too many times” or just “Google can’t use that number for verification”. I don’t know anyone I would ask to borrow their mobile phone number either. I would be perfectly willing to offer them several alternate email addresses for verification but that’s not good enough for them and neither will they accept my landline phone number to create the account. If you folks have no workaround to suggest for this I’d like to simply consider this post as an underscore to Leo’s observation above that it seems as if Google could accept a landline phone and offer a voicemail validation code, at least to setup a sub-account for an account in good standing. There must be many people out there who have no mobile phone but because no one can contact Google they appear to be blissfully unconcerned about this problem. Just a few words: Who do you guys work for? The future World Wide Phone List Co? Fairy tales are long worn out. I am not interested in texting, receiving texts or using passwords on my cellphone. I have one for emergencies. I guess this is the end of my gmail account. You would only need to receive a text message in the event you are locked out of your account, for example, if you forget your password, or in some cases, want to access your email from another location. If you don’t want to receive a text from them, you can also set up a recovery email address or two which you can use to verify your account. Google doesn’t use your phone number for anything else. If you have a mobile phone, this info is optional but highly recommended. Depending on how you add a phone number to your account, your number can be used on different Google services. For example, if you forget your password, your recovery phone number helps you get back into your account. I created my gmail account more than 10y ago, there was no mobile numbers required for verification. I even don’t remember the exact month & year of creation. Hence, now if any of my marketplace friends, which they are my competence also, want to sign in to my account, it will be very easy for them to do it. they’re already have my username and my cellphone No. and by providing them to Google Service they could access my email easily. what a stupid way to verify an account ownership!!! It’s not stupid at all. It’s actually a secure system. Just knowing your username and cellphone number isn’t enough to get into the account. They would need to have the phone with the phone number registered to the account in their hand in order to receive the password reset code. You should make sure to update/add current alternate verification mechanisms to your account. Needless to say, we disagree. I put my land line number by mistake and now gmail verification code is trying to send it there to no avail and meanwhile I can’t change my password or anything since I do not receive the land line verification code. I did change it to mobile phone but the verification code is still going to the original land line. Gosh what do I do – gmail team is not reponding. what if your account is hacked and compromised and they get your number and change it or delete it or put their own number into it then what? If your account is hacked then of course they can change whatever they like. It’s an important part of account recovery to make sure you set appropriate recovery information to begin with, keep it up to date, and check it once you regain access to your account. Adding your phone number does not put you at more risk, but rather gives you more opportunities to recover your account.